What does it look like beyond sustainability? Is it actually possible to get multi-capital profits? Are there principles that can guide an enterprise or corporation’s actions towards regeneration? The Regenerative Enterprise Institute has answers. From publications to speaking engagements, from one-on-one coaching to international corporate consulting, and from directed research to top-notch business incubation, we’ve got you covered. 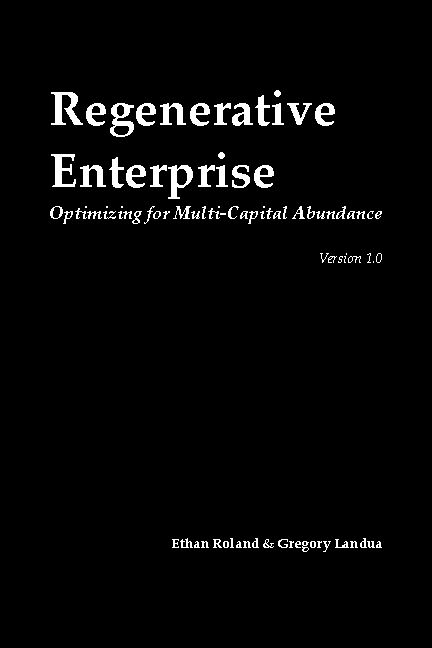 The full text of Regenerative Enterprise is available to the entrepreneurs and innovators of the world as a gift. If you feel moved to send a return gift, you may do so below via Paypal. If you would like to purchase a hard-copy of the book, please do so below via lulu.com. Would you like to translate Regenerative Enterprise into your language? Click here to contact us!